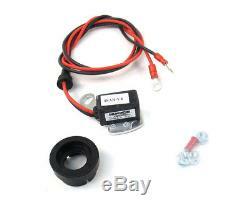 Ignition Conversion Kit-Ignitor Electronic Ignition Pertronix 1281. Associated Comments - 2000 : Delivers twice the voltage to the spark plugs, increasing horsepower, fuel economy, and spark plug life. 2:1 improvement over "points" in current fall time for increased coil output. Rotating cobalt magnets trigger a Hall Effect integrated circuit. Epoxy molding makes our module impervious to dirt, oil, grease and moisture. Marketing Description - 2000 : For over thirty years, the Ignitor has proven itself in applications ranging from race cars to tractors. The Ignitor replaces breaker points and troublesome factory electronic ignitions with a dependable, self contained and maintenance free electronic ignition system. The Ignitor has been called the "stealth" ignition because of its quick installation and nearly undetectable presence under your distributor cap. There is no "black-box" to clutter the engine compartment. For optimal performance, use the Ignitor with Flame-Thrower 40,000 volt coils. Canadian Harmonizing Tariff Code : 8511200000. Country of Origin (Primary) : US. Harmonized Tariff Code (Schedule B) : 8511200000. Life Cycle Status Code : 4. NAFTA Preference Criterion Code : B. Product Description - Extended 240 : PerTronix 1281 Ignitor Ford 8 cyl. Product Description - Long - 80 : PerTronix 1281 Ignitor Ford 8 cyl. Product Description - Short - 20 : Ignition Convers Kit. See Item Specifics section for additional specifications about this part. To confirm that this part fits your vehicle, enter your vehicle's Year, Make, Model, Trim and Engine in the Compatibility Table. Also review the notes section in the compatibility chart for additional specifications about this part. The engine types may include 5.1L 5114CC 312Cu. V8 GAS OHV Naturally Aspirated, 5.8L 5769CC 352Cu. V8 GAS OHV Naturally Aspirated, 4.7L 4727CC 289Cu. V8 GAS OHV Naturally Aspirated, 5.8L 351Cu. V8 GAS Naturally Aspirated, 5.9L 5917CC 361Cu. V8 GAS OHV Naturally Aspirated, 5.0L 302Cu. V8 GAS Naturally Aspirated, 3.6L 3622CC 221Cu. V8 GAS OHV Naturally Aspirated, 5.9L 360Cu. V8 GAS Naturally Aspirated, 6.6L 400Cu. V8 GAS Naturally Aspirated, 7.0L 7030CC 429Cu. V8 GAS OHV Naturally Aspirated, 4.3L 4261CC 260Cu. V8 GAS OHV Naturally Aspirated, 6.7L 410Cu. V8 GAS Naturally Aspirated, 4.4L 4458CC 272Cu. V8 GAS OHV Naturally Aspirated, 5.8L 352Cu. V8 GAS Naturally Aspirated, 7.6L 7582CC 462Cu. V8 GAS OHV Naturally Aspirated, 5.1L 5114CC 312Cu. V8 GAS OHV Supercharged, 4.8L 4786CC 292Cu. V8 GAS OHV Naturally Aspirated, 6.3L 6277CC 383Cu. V8 GAS OHV Naturally Aspirated, 7.0L 6997CC 427Cu. V8 GAS OHV Naturally Aspirated, 7.0L 7014CC 428Cu. V8 GAS OHV Naturally Aspirated, 6.6L 6654CC 406Cu. V8 GAS OHV Naturally Aspirated, 7.5L 7539CC 460Cu. V8 GAS OHV Naturally Aspirated, 6.7L 6720CC 410Cu. V8 GAS OHV Naturally Aspirated, 6.0L 6032CC 368Cu. V8 GAS OHV Naturally Aspirated, 7.0L 428Cu. V8 GAS Naturally Aspirated, 7.0L 7048CC 430Cu. V8 GAS OHV Naturally Aspirated, 6.4L 6391CC 390Cu. V8 GAS OHV Naturally Aspirated, 6.4L 390Cu. V8 GAS Naturally Aspirated, 5.4L 5441CC 332Cu. V8 GAS OHV Naturally Aspirated. This part fits vehicles made in the following years 1957, 1958, 1959, 1960, 1961, 1962, 1963, 1964, 1965, 1966, 1967, 1968, 1969, 1970, 1971, 1972, 1973, 1974. Parts Boulevard your one stop for Performance and Replacement Auto Parts. Portions of the part information on this page have been provided by WHI Solutions, Inc. The item "Ignition Conversion Kit-Ignitor Electronic Ignition Pertronix 1281" is in sale since Friday, May 8, 2015. This item is in the category "eBay Motors\Parts & Accessories\Car & Truck Parts\Ignition Systems\Electronic Ignition". The seller is "partsboulevard" and is located in Hillsboro, Oregon. This item can be shipped to United States, Canada, United Kingdom, Denmark, Romania, Slovakia, Bulgaria, Czech republic, Finland, Hungary, Latvia, Lithuania, Malta, Estonia, Australia, Greece, Portugal, Cyprus, Slovenia, Japan, China, Sweden, South Korea, Indonesia, Taiwan, South africa, Thailand, Belgium, France, Hong Kong, Ireland, Netherlands, Poland, Spain, Italy, Germany, Austria, Israel, Mexico, New Zealand, Philippines, Singapore, Switzerland, Norway, Saudi arabia, Ukraine, United arab emirates, Qatar, Kuwait, Bahrain, Croatia, Malaysia, Brazil, Chile, Colombia, Costa rica, Dominican republic, Panama, Trinidad and tobago, Guatemala, El salvador, Honduras, Jamaica.